Recently EJ, the cowboys and I were sitting at the dinner table chatting after a meal. EJ was talking about the freezing weather and said something about my toes being so cold they were popsicles. Bubba perked up and said, "What? Pop's Sick?" You can learn two things from this. One, I don't feed my kids popsicles. Two, Pop is never far from his mind. When Pretty Princess was touring the land she made a comment that stuck with me. "So, if I were a Hobo, I would live in the silo." Don't you love the way her mind works? She has always had a love for Hobos. Not sure where that comes from. Anyway, this thought always goes through my mind when I walk by the silo. Fast forward several months. EJ is out of town on business and Pop & Grammy are at the farm. Pop has been busy working outside during his stay. Well, Pop and Grammy left and EJ still wasn't home. It was my first night alone at the farm. "I can handle this" I told myself. The cowboys were in bed and I was checking up on all the animals. While outside, I noticed it...the silo door was cracked open. Now a logical person would reason that Pop could have forgotten to latch the silo door. But no not me...I had visions of Hobos dancing in my head. I knew it was just a matter of time before one moved in. After all, the expert on all things Hobo had deemed this silo a perfect Hobo habitat. I had to think on my feet. "Mr. Hobo? Are you in there? Need something to eat?" I yelled at the silo door. (I told you, I like to feed people...it was the first thing that came to mind) Hearing nothing, I decided to take a look. Nope, no Hobo this time. But if one does show up I'll be sure to make him a meatloaf or something. Disclaimer: If you are a Hobo reading this. I'm just kidding. I'm nice and hospitable and all but after you ate the meatloaf I would call the cops. You find your neighbors run away donkey in your back yard. Meet Leroy. When we moved to the farm everything was overgrown...everything. It was hard to see what was actually here. EJ was focused on clearing away all the crazy growth. He and our trusty "Fordy" tractor were always busy on a new project. When Pop, Grammy or any other willing family and friends arrived at the farm they were put to work. Here is the before and after of the chicken coop. I'm not going to lie. 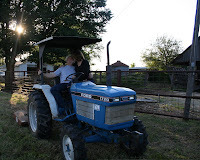 I thought Pop & EJ were a little crazy when they insisted we needed a tractor for the farm. When Pop purchased this blue beauty we were still living in a tiny house in the middle of town. We hadn't closed on the farm yet and we had to store the tractor at our house. You can imagine the looks we got when people drove by and saw the tractor sitting in our front yard. We aren't totally WT so EJ cleared out the garage so we could store it in there. This tractor fills each of the grandsons with wonder. They LOVE this thing. Honestly, I think all the guys feel this way. From the oldest to the youngest. Something about a tractor. Bubba started telling everyone that this is his "blue fordy" tractor. We think he heard us talking about the forty acres and got confused. Either way, this tractor is lovingly called "Fordy." I must say, the guys were right. Fordy is an invaluable resource here at the farm. I am beginning to understand the purpose of these big boy toys. They are a huge blessing and save many back breaking hours of work. Come to think of it, you men are pretty darn smart. We hope you have a wonderful birthday. We wish we could all be together to celebrate. Since we can't, here is a picture from Christmas to make you smile! We adopted them from our local humane society in September of 2008. We asked for Australian Shepherds. 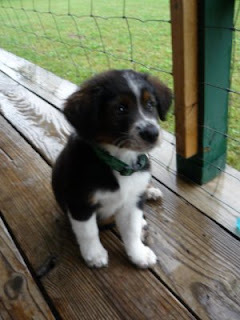 They told us they had a litter of puppies that appeared to be an Australian Shepherd mix. You never really know for sure! Look how much they have grown in 4 months! So far, they have proven to be good little buddies with the cats. In fact, Trigger and Huckleberry kennel together at night and Ranger and Daisy kennel together. Every night, when we are calling them all into the garage, Ranger plays hard to get. He acts like he doesn't want to get in the kennel but when we carry him near it he starts purring like crazy. He loves his puppy friend! What a dork! Well, that's it for introductions. We don't have any other animals for now. EJ has grand plans for other livestock but I am thinking we better learn how to garden and manage the animals we have before we add anything else to this crazy life! P.S. Bubba just climbed in my lap to see these pictures. He wants everyone to know that Huckleberry and Daisy live in the country with him. 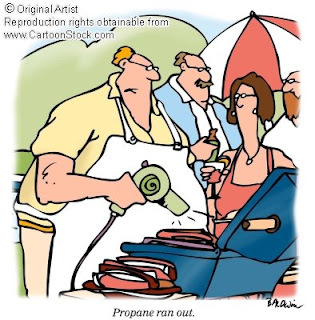 The propane man came today. These words should make any checkbook shudder! Last month the bill was $450 so I thought he would just top off the 'ol tank and give me a bill for $100 or so. WRONG. The bill was...drum roll please...$550. YIKES! Here is hoping that the new furnace at the farm will help us save some propane. I guess our first winter out here will be an eye opener! I had been reading the Veggie Bible and it kept saying that you need to have compost in your garden (I mean over and over and over and over again...). Got me scared that I didn't have a compost bin and everyone else did and that I somehow had missed the bus on this one. So I happened to come in contact with a guy who has LOTS of compost...again I'll quickly explain what compost is. Compost is/can be any mixture of: POO, straw, wood shavings, hay, dead plants, wood, veggies, fruit, grass shavings, dirt, etc. This guy happened to have a mixture of mainly POO and wood shavings. This stuff had been sitting there for quite a while, probably over a year. The POO had originated from his horses yet after all this was not the brown fluffy stuff that it started out as, it was RICH, DARK, SOFT, COMPOST, like the best dirt you can get. I know it's a little odd that I get so excited over POO, it's ok, someday you may too! I had a buddy of mine helping me with the use of his truck, or at least at the beginning of this that's all that he had thought that it was going to require, until I got a call that the POO guy's tractor was in use somewhere else. So we were going to have to shovel it into his truck ourselves. We were going to shovel it out, but hadn't planned on that hard piece of manual labor also! Well we ended up getting it all filled up and over to my place. However the only problem is that we'll need to get several more truck loads because I'll need some more and my buddy wants some now also...yes, he fell in love with the POO too! After we had spread the POO onto my garden and tilled it in, we were both digging our fingers into the bed to see how nice and soft it was...IT WAS AWESOME! GOTTA LOVE THE WONDERS OF POO! 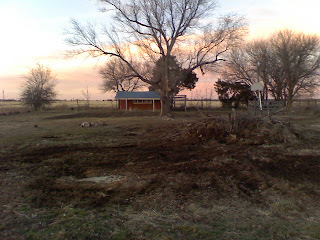 When we moved in to the farm we had four dead trees all measuring around 3-4 feet in diameter; and we had them cut down. That's it, cut down, we did all the rest. Cutting into small pieces to fit into the fireplace, splitting the big ones to fit also...all us. These were cut down in July sometime and they have been the bain of my existence since then...it thought originally that it would take a couple good weekends to get these cleaned up, however it has now taken over 5 months. Now I have been working on other projects, but this weekend I finally took the huge trunks that were scattered about in this lawn and pushed them to the burn pile...YEAH, now all we have left is this pile of small limbs, grass, and dirt. Manageable. Anyway, back to the farm house. Farm chick and EJ needed to do some SERIOUS cleaning before they moved in and along with that came some fix up jobs like painting, new carpet, new tub surrounds, etc. 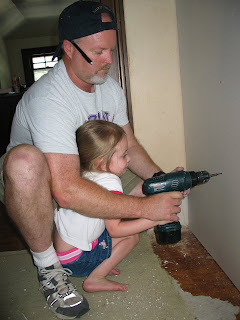 During our make over, I was trying to remove a knob that had been screwed and gorilla glued into a cabinet door. I was determined... it HAD to come out. We had picked out nice shiny new knobs. You know one of those "easy" ways to update your space, just simply change out the knobs. Let's just say, I didn't know my own strength and bent the hammer. I think I scared my sisters. They were looking to see if I was turning green and starting to rip my own shirt off.. Turns out it wasn't my brute strength (though impressive) that bent the hammer. 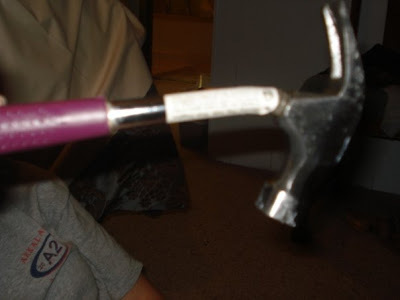 Apparently they make "girl" hammers weaker. Coooommme on. 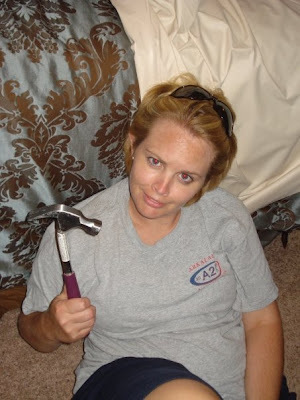 You don't think a sister needs a bend resistant hammer? I may look girlie but I think I need to start purchasing hammers for their strength, not for the pretty purple color of their handles. Hmm. Who knew?! In order to feel really "farmy" we chose to get some chickens. Egg layin' chickens that is. DW & Doc bank roll the chickens and EJ and I do the work. We have had lots of fun learning about them and caring for them. They came to live at the farm 0n September 17, 2008 as day old hatchlings. Catch up on their story by checking out the post Happy Chick Day. You can see what they looked like in their adolescence here. They are grown ups now... I know that looks like tons of poo under them but it's really lots of feathers. Don't get me wrong they poo a lot but the majority of the poo lookin' stuff in the pic is actually feathers. I don't know why I am making excuses for them. I really like the black and white ones. They just look cool. There are 5 of them in our flock. There are also 5 red ones and 5 blackish ones. For a total of 15. Bubba explaining to the chicks how they are supposed to fly into the nesting boxes and lay eggs (they haven't started laying yet) "Wubba, stay out here." He can't stand it...he has to be where the action is! Look out chickens! Which one of you is brave enough to come down the ramp into the chicken yard? Trigger is on the other side of the fence taunting the chicks. You know you don't have what it takes. One brave soul finally gets the courage up to head into the yard - then Wubba promptly shuts the door on her - I'm pretty sure her clucks meant "I really hate that kid." When Rock Star was in elementary school she fell in love with a little kitty our family adopted and named Coal. We would later learn that Rock Star is severely allergic to cats. Hmmm...could that be why she kept getting sick? Over the years Coal has always lived with Grammy & Pop. Obviously, Rock Star couldn't take him. He is perhaps the grumpiest cat most folks have ever met. I'm not sure what made him this way. We always loved him and took good care of him. He sort of has a split personality disorder. One moment he is purring away on your lap, the next minute he turns around a bites you. Geez! Well, Mr. Coal was recently relocated to Four Sisters Farm. We thought he would enjoy being here where he could run free and not be alone when Grammy & Pop traveled. It turns out that he hated that idea. He moved in at the end of November. We did not see him or hear him after the first night we got him. We were going to keep him safe in the garage at night (just like we do with Trigger and Ranger). When we couldn't find him for a few days we thought it wasn't a big deal. A few days turned into a few weeks which turned into a month. No one wanted to say it but we all figured Coal was a goner. Fast forward to a few days after Christmas (now over a month since he had gone missing), Wubba and I headed out to the pole barn on a little walk. When all of a sudden we heard, "Mrrreeoow." It was Coal's signature grumpy meow. He started walking towards us. He let me pet him and seemed genuinely happy to see us. It just so happens that Pop & Grammy were staying here at the time. Pop was outside and got to see Coal...I know Pop has a love/hate, well mostly hate relationship with that cat but he actually seemed happy to see him too. Grammy was gleeful when she heard the news and quickly called pretty princess to report that we had a Christmas MiraCOAL. (You will learn that Grammy loves cheesy jokes). That cat survived a wicked winter storm and near starvation. We have decided that perhaps he is too mean to die. Whatever the reason, I'm glad he is still here. I have enjoyed spending time with him. I like to bring him his own bowl of food and water. He is pretty skinny, so like a good momma, I'm trying to fatten him up a little (I don't think we have Italian blood but man do I like to feed people like an Italian grandma). I am protective of Coal's food because I want to be sure he is getting enough. We have a little bit of a problem in this area...I am not going to mention any names but his initials are RANGER. Look at him. He is on a mission. He wants to eat any juicy morsel Coal has left behind. The thing is he knows I don't want him eating that food. He has a food bowl along with the other cats in another area. You can't tell by the pics (they were from good angles) but Ranger is a hefty kitty cat. He outweighs his sister by a lot! The last time Pop was here he said, "that Ranger needs to find a salad." Look at him trying to sneak away when I caught him red-handed! Here he is all full and content. If he could speak he would say, "I love Coal's leftovers like a fat kid loves cake." So, the first time I laid eyes on the four sisters farm I was a little....ummm... concerned. I LOVED the land, loved the virtually allergy free house (after much work) and I loved that my boys were immediately transformed into different children! My oldest is a bit shy and cautious, but not at the farm! Here he is free and silly! But back to my initial thoughts! I scoped the place out, walked around a bit and discovered two things that I'm not particularly fond of. So when dad asked me "what do you think of the farm, sis?" I said, "I love it! I just don't like bugs and poop." I didn't mean it to be funny, but dad was pretty amused. I'm sure I sounded like a silly city girl, but this girl knows what she likes and those two things are not on the list. Now that I've spent some time there, I am in love! Bugs, poop and all. Well, I don't love the bugs and poop, but you get what I mean. I'm thankful beyond words for this place that my boys will flourish. What a blessing God has given this family. Lou: Mom, I can't wait to go to the farm. Lou: (Looking me with a challenging look in her eye) Yeah, Mom, because I can do A-N-Y-T-H-I-N-G I want there. (Then adding the "stinger") POP SAID SO. Me: Reeeaaally. Pop said so, huh. Well, let me tell you something, Missy, I'm still your Mom, even when you are at the farm and you still have to obey. Lou: (Knowing that Mommy can't always be there) Yeah, but Pop said I could. You can bet that when I got to the farm, I relayed the conversation to my Dad and you know what? He said, "I DID tell her that. She's exactly right". 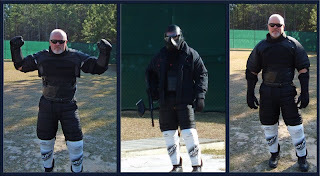 Good thing I know that he's the most safety minded, Papa Bear man on the face of the earth or I might actually be a little worried. Truth be told, I can do whatever I want to do at the farm, too. And that is why I love to go there. I have time there. Time to love on my nephews. Time to play like a kid with my kids. Time to drink a cup of coffee with my sisters on the porch or take a familly walk down to the pond. Time to smooch on my hubby and hold his hand. Time to be the kind of Mom I want to be. The other day, I had Pretty Princess over here watching Bubba and Wubba. Well, I also had the furnace repair man here working. I didn't feel very good about leaving a young lady here with a man in the basement she didn't know. Romeo was to meet her after her babysitting job for a date so I asked if he could come out a little early. As any Romeo would do, he obliged. Fast forward to right after bath time. Bubba was still in the tub (with no water in it) while Pretty Princess put a diaper on Wubba. All the sudden she heard, "Get out Poopy!" from Bubba in the bathtub. She thought to herself, "this is very bad." Sure enough there in the bathtub staring her in the face was a big 'ol pile of poo poo. Pretty princess quickly cleaned up the child, got him into his PJs and finished dressing Wubba as well. Then Pretty Princess did what any princess would do. That's right, she waited for her knight in shining armour to come clean her nephews poo poo out of the tub. Now that is a man in love! Thanks Romeo. You just earned some points with this sister! I have been so very blessed in my life. I have been married to Grammy for over 32 years and she is my “Great Love”. We have been blessed with four beautiful daughters and I am so proud of each one. God has blessed me beyond reason and been faithful to me despite all my faults and blemishes. I consider myself to be a fortunate man as I have known the grace of a loving God and the joy of a loving family. For years I watched my older brothers and sisters go nuts (actually a little crazy) over grandchildren. I never doubted their zeal but never got much of an understanding from their attempts to verbalize this phenomenon. Such exchanges always ended with "wait until you get your own". As it turns out they were right!! When our oldest (Unconventional Doctor's Wife) gave birth to our first grandchild (Lou Lou), it took approximately 10 seconds for us (all of us) to become completely smitten. I can't explain the feeling but I know it is rooted in a love that comes from deep inside and runs strong within me. I remember being afraid that I loved this little girl so much that I could not possibly love other grandchildren with this same kind of intensity. I shouldn't have wasted my time on such silly thoughts. God equips grandparents with a wonderful capacity to experience each grandchild as a new miracle. 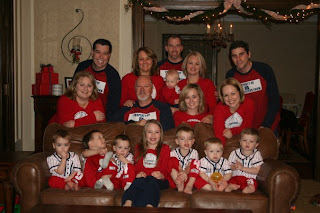 We now have eight incredible grandchildren and I have been overwhelmed with emotion as I have held each one. There has been no subsiding of emotional intensity, no reduction in joy and no lessening in the sense of blessing. There has been one overwhelming thought that has accompanied each new grandchild; God, who am I that you should bless me so? As I noted above, Lou Lou is our first grandchild. She did a great job of indoctrinating our whole family into the next phase of life and set the stage for siblings and cousins to come. She has given me moments of such great joy that I could not help but be moved to tears. She is smart, funny and I am always blessed to be in her presence. It was this little girl that began a change in this man's heart. Before the birth of Lou Lou, I had little sense of perspective regarding the next generation. I have always been driven to succeed and was constantly looking for the next challenge. 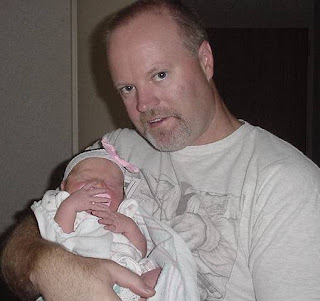 I was not done leaving my mark on the world and while I loved my family, I was not ready to sit down in a rocking chair, put on 50 pounds and be just another grandfather. There were too many mountains to climb, horses to ride and adventures to experience. As our family has continued to grow, God has begun to change my purpose and my passion. It started slowly and I can not remember any real big event that happened. I slowly began to get a sense of purpose that has little to do with my career or my “Bucket List”. It has to do with being a grandpa and the role I am supposed to play for my children and grandchildren. I have had an epiphany and understand my most valuable contribution in this life will be to love our little ones with a great love. Some of you will know what I mean when I say a “great love”. I have been fortunate to experience it several times in my life. I am completely committed to our grandchildren and resolute in my devotion. And, while I promise to listen to my children, I have every intention of spoiling my grandchildren in a healthy way. That leads me to this story. When Lou Lou was about 3 years old, I had a vivid dream. This was a strange kind of dream that gave me pause and I told Grammy about it the next morning. This type of dream had never happened to me before and has not happened since. In the dream, I was on a four wheeler and was riding across a pasture in an open field. It was beautiful rolling land and the sun was glinting off a great little farm pond. I remember feeling happy, free and completely satisfied with life. I decided to stop and just soak in the moment. It was at this point that I heard another four wheeler and looked back. The rider had stopped on the dam of the pond and was taking off a helmet. When the helmet came off, the long brown hair came flying out and I heard her call to me, "Hey, Pop!" as she waved. I remember knowing beyond a shadow of a doubt that it was a teenage Lou Lou. She was smiling, beautiful and happy and I was waving like a mad man. I remember thinking God was assuring me she would be safe and grow to be a beautiful woman. I woke up praising God and thanking him for this assurance. The vision still had me smiling the next morning and a tear might have leaked out when I told Grammy about the experience. I had no idea the significance this dream would have on the acquisition of Four Sister’s Farm. Fast forward ahead about 3 years and you find Grammy and me living in another state so I can pursue the greatest challenge of my working career. The work is exciting and I am experiencing success and promotion. At the same time, God is continuing to foster the calling to be close to and involved with our children and grandchildren. 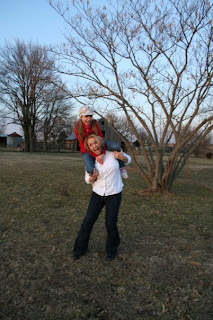 In December of 2007, we were back in Kansas reveling in a Christmas visit with our family. Our son-in-law, EJ was on the computer looking at rural real estate in the area. 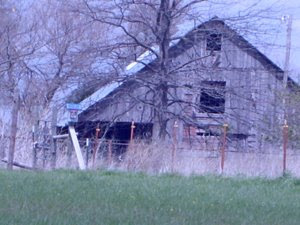 He came across a 40 acre farm that looked interesting but severely run down. We drove by the property and it looked kind of interesting but we didn’t have time to officially see it. On the plane ride home I told Grammy, “If that place is still there in February, I think we ought to look at it”. We agreed. 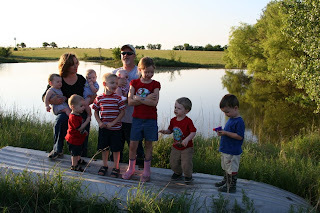 In February, we returned to the place that we love (Kansas) for the expressed purpose of looking at the 40 acre farm. 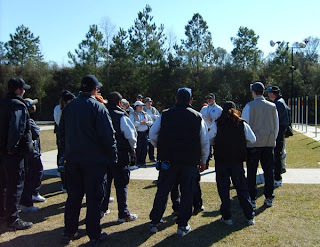 We made arrangements and looked at the place. The house was not much, the out buildings worse, and the place was overgrown with 6 foot weeds which made it difficult to get around. However, the old barn was fantastic. Don’t get me wrong, it was dilapidated, but it was also unbelievably charming. I decided to walk the property with EJ. We walked north away from the homestead and the land was beautiful. 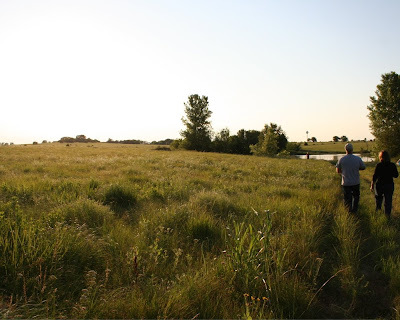 The majority of the land is a rolling hay field separated at the half way point by a beautiful farm pond. As I took this walk, the vision of Lou Lou is not far from my conscious thoughts. So when I saw the farm pond begin to appear in the distance, my heart started beating just a little faster. However, as I got closer there did not appear to be a dam, like in the dream. With a little disappointment, I continued my walk. In the first moment alone with Grammy I related my experience and told her this was our place. She did not question it nor did she act like anything strange had just happened. She simply said, “I’m in Baby”. (She calls me Baby sometimes.) With this partnership decided, we began to seek like acknowledgement from God. This came in so many ways over the next several weeks and culminated in a crazy closing on the property. God was there every step of the way and always just a little ahead. The final question was, would our family be as taken by the farm as us? Farm Chick, EJ, and the Cowboys answered the question by being willing to homestead the place. Unconventional Doctor’s Wife and Doc had no choice after Lou Lou, Bub and Southern Gentleman (but not Ladybug, she’s too small) got to run around a little bit. (They are now partners in the chicken business.) But the jury was still out on Rock Star and Pretty Princess. Rock Star and PhoJo finally got to see the place and signed off with one stipulation by Rock Star. No poop, no bugs. She has since reneged on this (cause her little super heroes want to live with Pop at the farm; but not sleep there). I knew the Super Heroes would win her over!! Finally Pretty Princess came and walked the place. She was contemplative as she (much like her father) does not like change. She finally gave her blessing and has since frequented the place to take walks to the pond with Romeo. This farm represents roots for us. Hopefully, it will be where Grammy and I live out this great love of ours. It will hopefully honor God and bless our children, grandchildren, family and friends. My vision is for our little ones to run free and experience unconditional love. I pray I live long enough to see their children run on this land. This is home for Grammy and me. We will look no more and we will put our hearts and labor into making this our family home. It will be a place where all are welcome and there will always be room for one more. People say I don’t smile enough! I’m going to work on that ’cause I want you to feel welcome if you stop by!! Come see us some time and Grammy and I will take you on a walk to the pond. Four Sisters Farm has an abundance of cats! When EJ and I found out we were moving here we thought we should get a couple of barn cats. We went to pick out two little cuties from another farm in the area (EJ's Uncles Place). 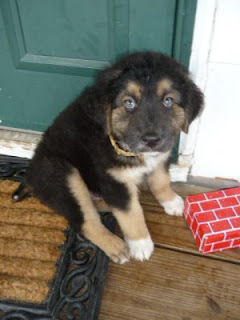 Anyway, here is what they looked like when we got them... The grey one is Ranger and the white one is Trigger. Ranger is a boy and Trigger is a girl. (we promptly had them fixed). Aren't the adorable? Here they are as big kitties. Please note that the man in the above picture swore he hated cats and would never have one. Now he has plenty of them and he loves them. Sometimes, when he doesn't know I am watching, I see him playing and talking with them. He has developed quite a bond with Trigger and Ranger. You are a big softie, EJ! Finally, we added one more kitty to the ranks...Coal. I'll tell you more about him later because this post is getting long. Here is his picture. If you are keeping track that brings our number up to 6. They are really fun to watch and they are handy too. They like to hunt mice (which I unfortunately witnessed first hand. Yuck!). They are also fabulous entertainment for the dogs who love to herd them into the barn. Well, they heard the wild ones. Trigger and Ranger are their little buddies and Coal would scratch their eyes out.